Much of the charm of the historic centre of Seville (and, it has to be admitted, many of its inconveniences) lies in its networks of narrow streets and little squares, and after the main monuments have been seen striking out into the back streets in exploration mode, not knowing exactly what you might find, or how to get back to your apartment, is one of the city’s great pleasures. There is, however, one outstanding exception to this rule. The Avenida de la Constitución, which runs from the Ayuntamiento (town hall), past the front of the Cathedral and Archivos, to the Plaza Puerta Jerez, is almost every inch a modern European style boulevard; wide, traffic free and tree-lined, with the terraces of pavement cafés strung intermittently along it and transportation provided by sleek modern trams that glide quietly back and forth, with the occasional clang of the bell to warn an inattentive pedestrian of their presence. But only almost every inch. One of the fascinations of this stretch of road is the surprisingly harmonious combination of styles of different cultures and times, from the Torre Abd El Aziz (early 12th century), through the Cathedral (15th century) to a number of important early 20th century buildings. The modern name is in honour of the Spanish Constitution of 1980, but prior to that its different sections were known by a number of other names, including Genovese (as attested by a small plaque near Starbucks), after the Genoese merchants settled there by Ferdinand III after the Christian conquest, las Gradas (the steps in front of the Cathedral), Libertad (during the Second Republic) and Queipo de Llano (during the Franco era). Despite its centrality and importance in the modern city, this area remained outside the city walls throughout the Roman, Vizigothic and Moorish Caliphate periods, and a secondary arm of the river ran from where the Ayuntamiento stands today, along the course of the Avenida, before returning to the main river in El Arenal. It was by this means that the Viking longboat, discovered under the Plaza Nueva, reached its final resting place during the raid of 844 AD. From the early 12th century the site of the Cathedral and the area in front of it were enclosed by a new wall, with exit gates near the later Plaza San Francisco at one end, and near the Cabildo at the other. At the same time the Alcazar enclosure was extended to the Torre Abd El Aziz, the Miguel Mañara arch being the gate to the palace compound. The second half of the century saw the building of the Grand Mosque, and further extension of the city wall towards the river. From 1401 work began on the demolition of the Mosque and the building of the new Cathedral, completed in 1526, and the largest Gothic cathedral in the world. A large section of the frontage is actually a separate church, the El Sagrario, built in the 17th century in the baroque style. The Avenida in its modern form was created in the first third of the 20th century, as part of the preparations for the 1929 Spanish American exhibition. 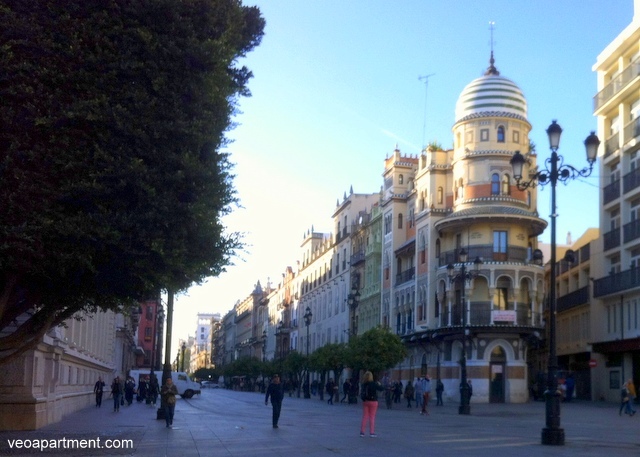 The northern end was substantially widened, and the fine buildings along this section all date to this time, including the emblematic Adriatico (the circular building facing the town hall), and the Casa Álvaro Dávila (now a bank) on the corner of Garcia Vinuesa. 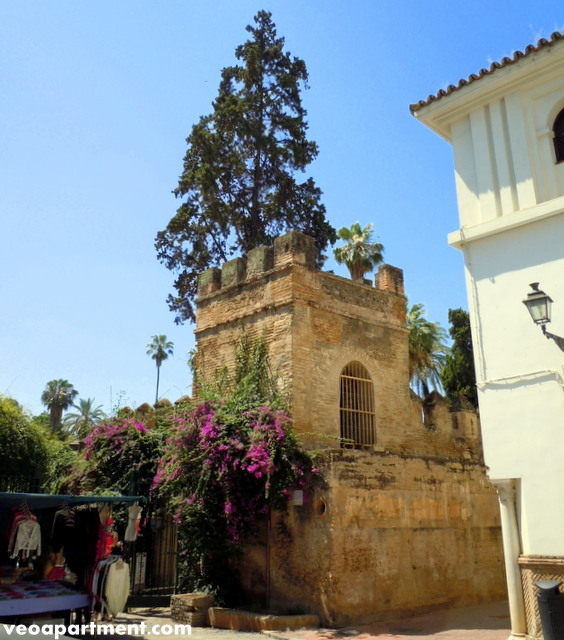 The southern end, between the Archivos and the Puerta Jerez, did not exist at all until the 1920s, the area being occupied by the Convent of Saint Thomas and the University of Saint Mary of Jesus, of which only the chapel remains. Most notable of the buildings on this newly created section is the Coliseo, now government offices, but originally a cinema and theatre. The ticket windows can still be seen in the facade. 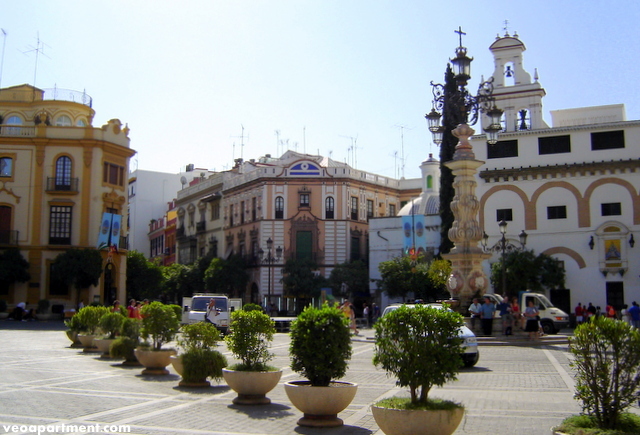 Pedestrianisation and the installation of the tramway came in 2007, together with new orange trees, ornamental streetlamps and a cycle path, and the absence of traffic has helped to convert the Avenida into a pleasant and interesting place to stroll. This has also resulted in something of an explosion in the number of bars and cafés, mostly aimed at the tourist trade. 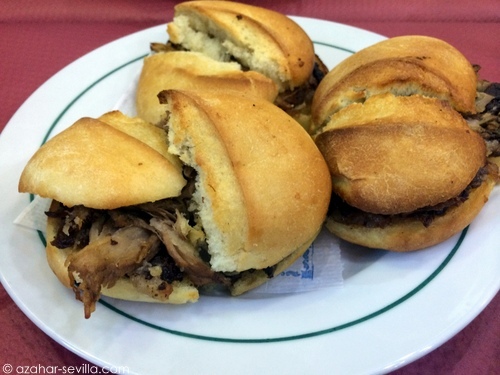 Best places to stop for a coffee and a snack are the Horno San Buenaventura and Genova cafe-bar, and just off the main drag is one of my favourite traditional tapas bars, Casa Morales. From the Plaza San Francisco to the main entrance of the Cathedral is the official “carrera” or processional way, for the city’s big religious festivals, especially Semana Santa (Holy Week), and at these times the avenue is lined with seating and thronged with people. It’s a great spectacle, but normal life does come to something of a halt. At Christmas it’s strung with lights along its entire length, and the annual Bélen (Bethlehem) Fair is held in the street between the Cathedral and the Archives. Booking an apartment in this area of the city is surprisingly easy, and veoapartment has a wide variety from studios to larger family apartments. Not everyone’s a foodie, but pretty much all of us like to eat, and to enjoy ourselves in the right surroundings while we do it. Many of us also want to do our eating out the way locals do it, and to try some of those typical dishes that everybody knows about (or has at least heard of). 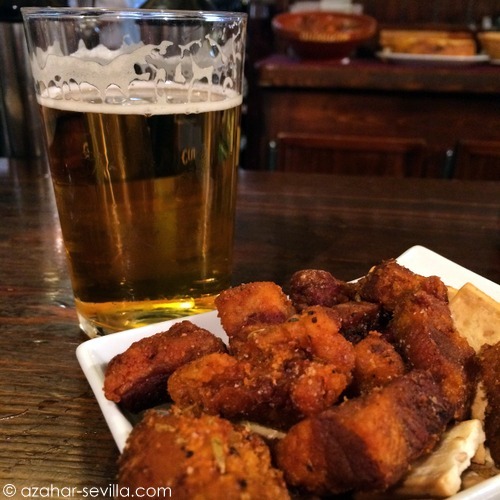 So this is a kind of everyman’s guide to eating out in Seville, and getting a feel for what tapas is all about, not a gourmet guide to the best restaurants. First, just to clear the air, there are a few common myths that have to be dispelled. 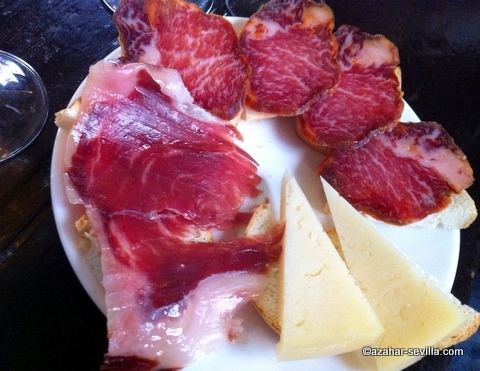 To begin with, tapas is not a kind of food, it’s a social custom. The answer to the question, “What Spanish foods have you tried?” is not “We’ve had some tapas”, it’s “We’ve had some calamares and tortilla de patatas.” Next, Spanish food is spicy. It’s not. You’re thinking of Mexico. The Spanish have put up a wall to keep spicy food out (who says travel writers don’t do satire?). Paella is the national dish. Actually, it’s a local speciality from Valencia, and a proper one isn’t made with seafood. Not that you can get a proper one in Seville. Lastly, the Spanish are always drinking sangría. In fact, for everyday purposes the Spanish prefer a tinto de verano – red wine with lemonade and ice, which is more refreshing and less intoxicating. So, to business. 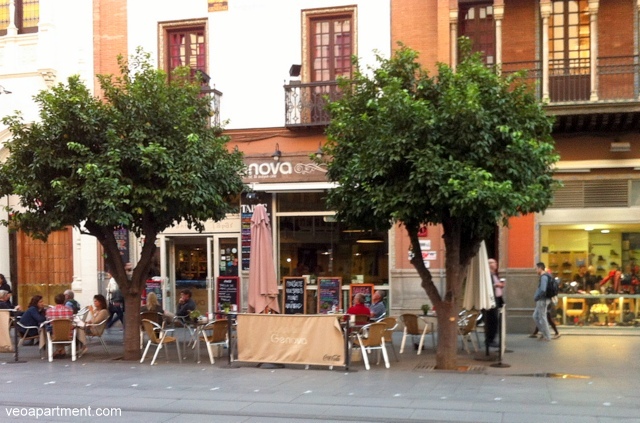 Given that tapas bars can be crowded and noisy, and that there are a lot of them, just deciding which one to go into can be bewildering and intimidating. Doing a bit of homework before you arrive will help. Look for those bars that crop up on lots of lists, not just one. Most important, though, don’t be intimidated. In some bars tapas are only available at the bar itself, and at tables or on the terrace you have to have larger plates, but there’s no general rule, so you have to check. If there are just two or three of you, sitting or standing at the bar puts you in the thick of things, but four or more it’s easier to talk if you’re sitting at a table. You can get media raciones (half-plates) para compartir (to share). Don’t overdo the ordering. One tapa per person per round is usually good. You can order more if you’re still hungry, stop if you’re full. If you’re not impressed with the first round, you can move on. In any case, moving on is essential to a proper tapeo (the Spanish equivalent of a pub crawl, but more civilised and with proper food. And speaking of food, what should you be eating? Pork is king, and there are lots of fantastic pork dishes, from carrillada (braised cheeks) to solomillo al whisky (pork tenderloin), as well as blood pudding and tripes for the more adventurous. Cod and tuna are the most common fish, or boquerones al vinagre (marinated fresh anchovies) as a starter. Prawns, octopus and squid are also universally available. I’m often asked if the Spanish eat vegetables, and of course they do – spinach with chickpeas and marinated potatoes are essential. 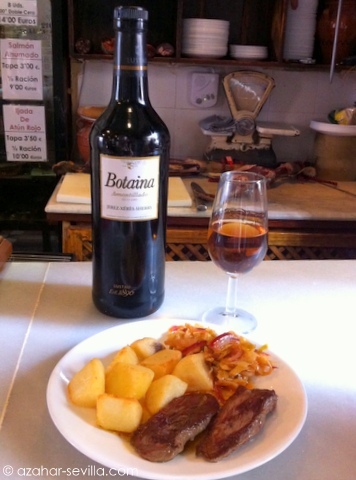 For me, though, the one thing you have to have is our unique Spanish jamón, washed down with some Fino or Manzanilla sherry. If you haven’t tried it yet I guarantee an epiphany. We have lots of holiday apartments to rent as a base of operations, in all neighbourhoods of the historic centre. 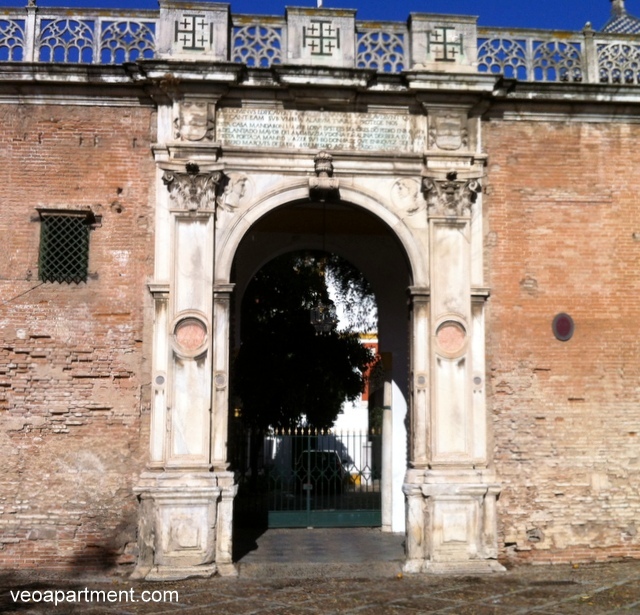 With the obvious exception of the Royal Palaces of the Alcázar, the Casa de Pilatos (Pilate’s House) is the largest and historically most important of the grand palaces of Seville, and is still the family home of the Dukes of Medinaceli. 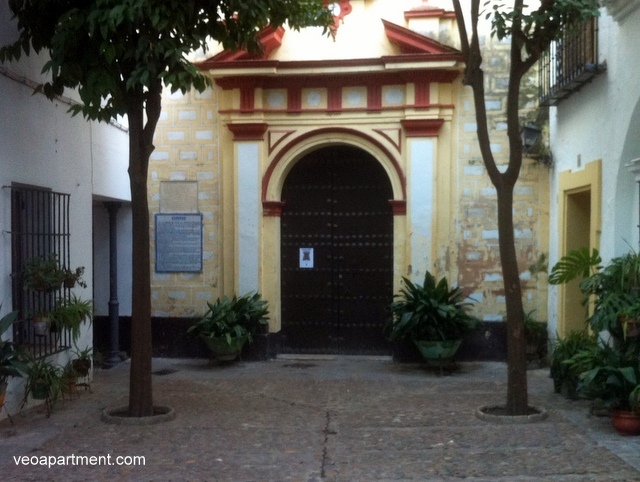 It can be found in the eastern part of the old city, between the Santa Cruz and Santa Catalina, in the Plaza de Pilatos. Construction of the palace (originally the Palacio de San Andrés) was begun in 1483, at the transition of the mediaeval to the early modern period, by Pedro Enriquez de Quiñones and his second wife Catalina de Rivera, and was continued by their son Fadrique Enriquez de Rivera, 1st Marquis of Tarifa. In 1519 Fadrique went on a pilgrimage to the holy places of Jerusalem, returning in 1520 by way of Italy, both of which experiences greatly influenced him. The following year he instituted the Holy Way of the Cross as a reproduction of the original in Jerusalem, starting from the palace (which became known as the Casa de Pilatos) and leading to the Cruz del Campo (the Cross in the Field), which can still be seen in the modern suburb of Nervion, and which lends its name to the local beer, Cruzcampo, which used to be brewed nearby. 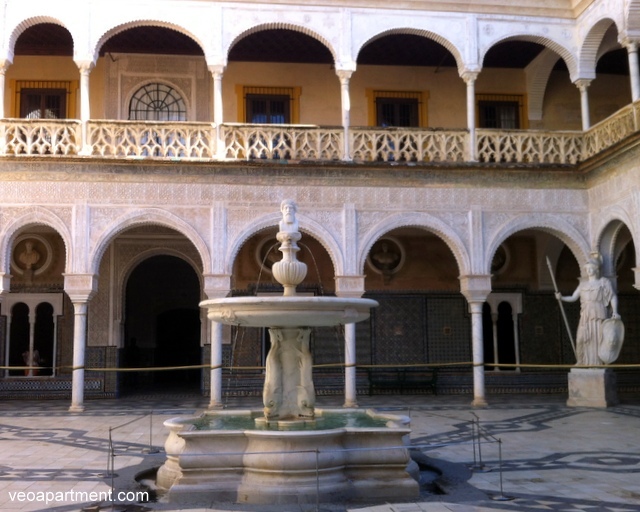 Entrance to the Palace is through an Italian Renaissance style gate of the early 16th century, which leads into the apeadero (a reception courtyard for carriages), and beyond that to the Patio Principal, a typical Andalusian courtyard paved with marble, an Italian marble fountain, and colonnades decorated in the Mudejar (Moorish) style. 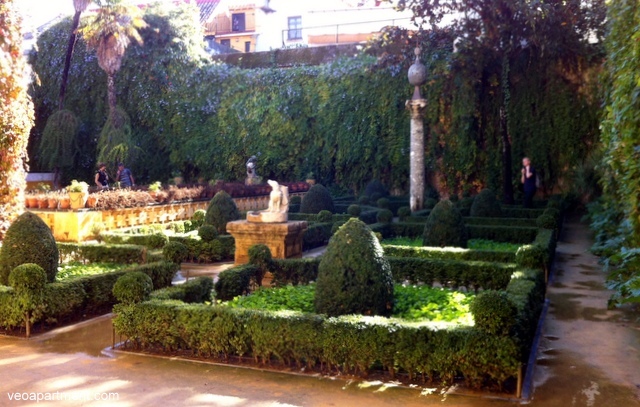 The courtyard is adorned with the busts of twenty four Spanish kings and Roman emperors, with four of the most important pieces of the Palace’s collection of sculptures in the corners. On the far side of the courtyard is the Palace chapel, known as the Chapel of Flagellation for its central statue of Christ being whipped. 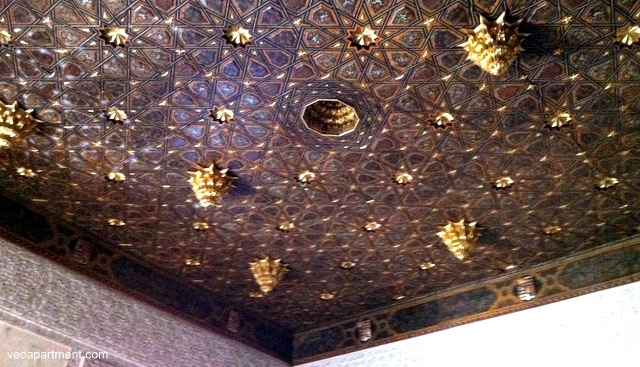 Built and decorated in the Mudejar-Gothic style, it’s possibly the oldest room in the palace. To the right is the Praetor’s room, which although a slightly later product of alterations to the courtyard, is notable for the mudejar decoration of its walls, and the beautiful caisson coffered ceiling with the coats of arms of the family line. Beneath the tower is the Praetor’s study, which connects the courtyard with the large garden. The walls are covered with ceramic tiles in a number of different patterns and there is a superb ceiling with a ten sided star in the centre. The grand staircase is probably the most magnificent part of the building, connecting the more public space of the patio with the private family quarters on the upper floor. Sumptuously decorated with colourful tiles, its crowning glory is the mudejar honeycomb ceiling, modelled on the one in the Ambassador’s room in the Alcázar. The upper floor itself recreates the interior of the house palace with mudejar plasterwork and ornate wood ceilings and contains artworks by Francisco Pacheco, Goya and Luca Giordano, among others. My favourite parts of the palace, though, are the two gardens. The large garden, originally the orchard, was created in the second half of the 16th century by an extension of the palace to enclose it. The layout and decoration are in the Italian renaissance style, complete with a grotto in one corner, and niches for the archaeological exhibits shown there. The small garden (el Jardin Chico) was created from two small gardens in the early 20th century, and has a pool that was once fed by water from the Roman aqueducts, a rare privilege enjoyed by few, and which made owning a garden a sign of social distinction. 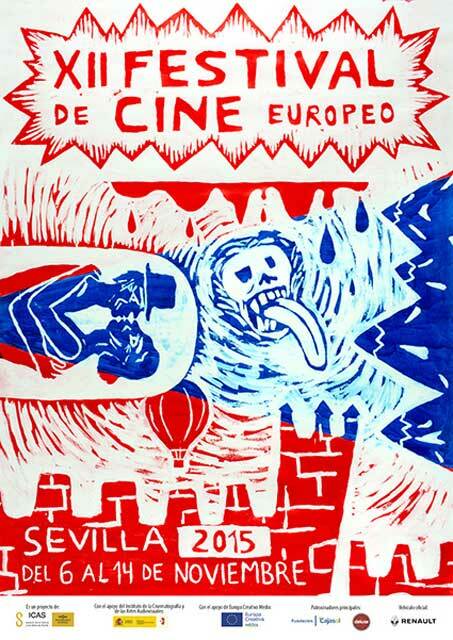 The 12th Sevilla Festival de Cine Europeo (SEFF 2015) comes to town on Friday, November 6, for a nine day stay until Saturday, November 14. The primary organisers are the Institute of Arts and Culture of Sevilla (ICAS), and the Institute of Cinematography and Audiovisual Arts (ICAA), with the support of the Creative Europe Programme of the European Union. It aims to bring together performers and professionals from the world of cinema, with journalists and critics, financial providers and the general public, and to showcase the best of contemporary European cinema. The core of the Festival is the competitive sections of different categories of films. The main Official Section is for the year’s most important new European films, the winners receiving the Gold (first prize) and Silver (second prize) Giraldillos. Among the films on show will be “Bitter Well”, “Berserker”, “Toxic Love”, and “The Foreigner”. Other sections include New Wave and New Wave non-fiction for new talents and fringe cinema, short films, Spanish cinema and cinema for younger viewers. There will also be awards for Best Actor, Actress, Director and Screenplay. The principal venues will be at Cines Sur in Nervion, the Alameda Theatre, and the Lope de Vega Theatre, where you will also be able to see special screenings, tributes and retrospectives. There will be opportunities for roundtables and seminars with leading figures from the world of European cinema, and exhibitions and concerts with cinematic themes. 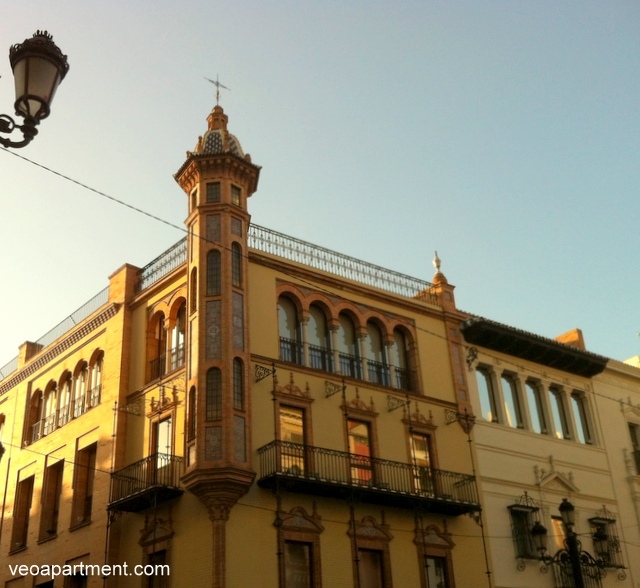 For lovers of cinema planning to visit the festival we still have a range of quality holiday apartments available in the historic centre of Seville. 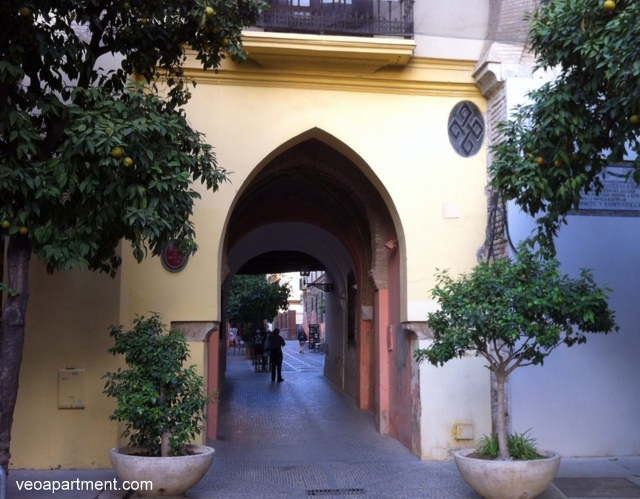 The Santa Cruz is the best known of Seville’s old neighbourhoods, and corresponds roughly to the late mediaeval Jewish quarter. It’s a major part of the oldest section of the city, but although it’s still based on the old Roman street layout and has many authentically old buildings, it actually owes much of its picturesque charm to the renovations and general prettifying that began in the Napoleonic era and peaked during the preparations for the 1929 Spanish American exhibition. 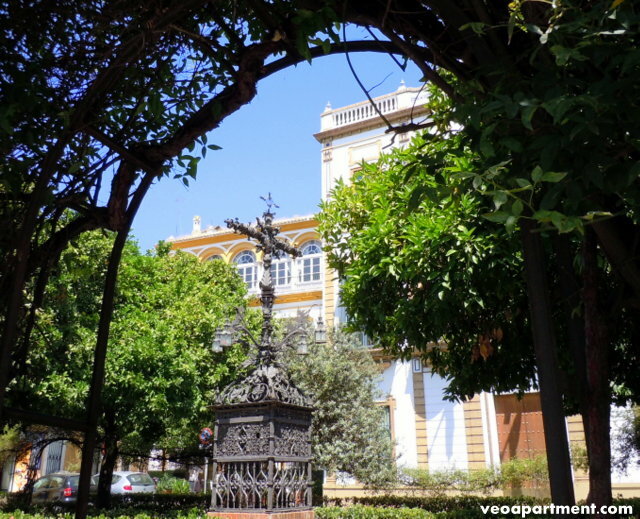 La Plaza Virgen de los Reyes (Virgin of the kings) is the classic square behind the Cathedral and in front of the Barrio Santa Cruz. 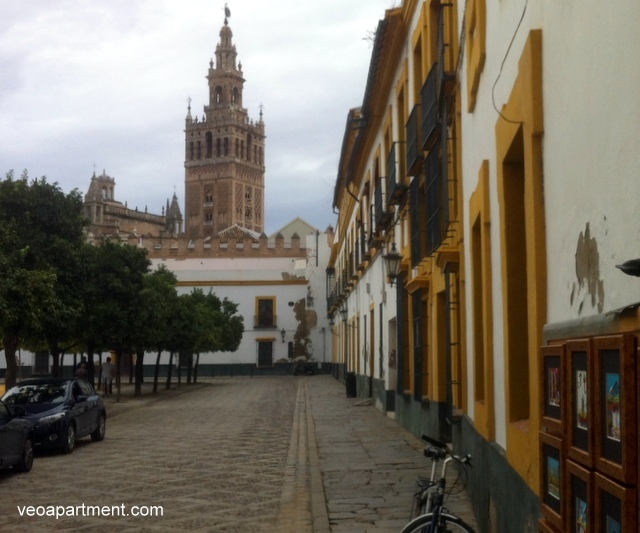 It’s enclosed by three of Seville’s most important historic buildings, the cathedral (including the Giralda tower), the Archbishop’s Palace and the former Hospital of Santa Marta that now houses the Convent of the Incarnation. Although these buildings date back 500 years or more, the square itself was only created in the 18th century by the demolition of the Church’s administrative buildings within it, and its modern form was achieved with the remodelling of the entrance to Mateos Gago in the 1920s. The fountain and ornamental streetlight in the centre was added for the 1929 Spanish-American. Spend a few moments in the shade of the orange trees enjoying the view of the tower and doing some people watching. 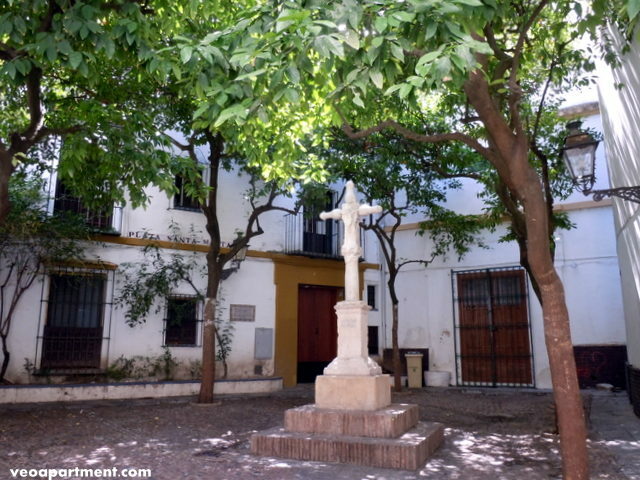 From Los Reyes take a short detour into Plaza Santa Marta, the little square at the end of alley behind the statue of the Pope, and discover an oasis of peace and quiet. The cross in the centre dates to 1564, but was only brought here in the early 20th century from the old hospital of San Lorenzo in the Macarena. The door to the right is the back entrance to the Monastery of the Incarnation. 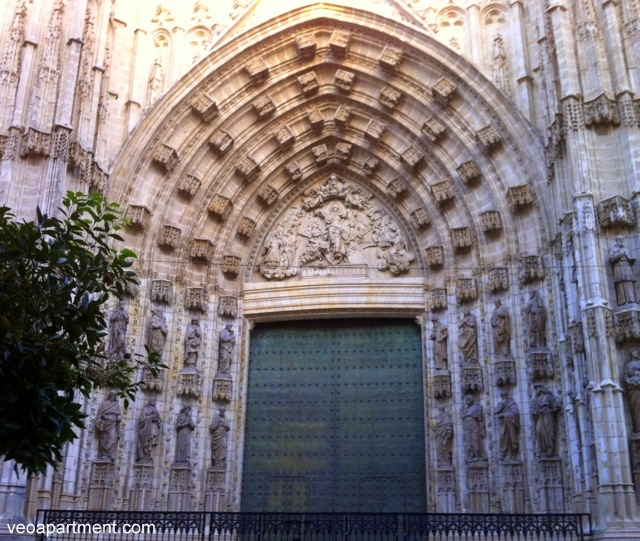 Next to Los Reyes is the “second square”, La Plaza del Triunfo, which is effectively the World Heritage centre, with the Cathedral, the Alcázar Palace and the Archivos de Indias on three sides, and the Casa de la Provincia on the fourth. The walls are over a thousand years old, and were once the outer walls of the city. The square takes its name from the small monument in front of the Archivos, erected in 1757 to commemorate the Cathedral surviving the Great Lisbon Earthquake. Like many others the square was remodelled in the early 20th century, and the monument to the Immaculate Conception was erected at this time. Through the archway beside the square is the Patio de Banderas (Courtyard of the Flags), where the Kings of Spain once greeted foreign ambassadors. The rectangular promenade around the outside is formed by two rows of orange trees, but the fountain that used to grace its centre has disappeared since the recent archaeological investigations into the earliest stages of the Palace’s history. 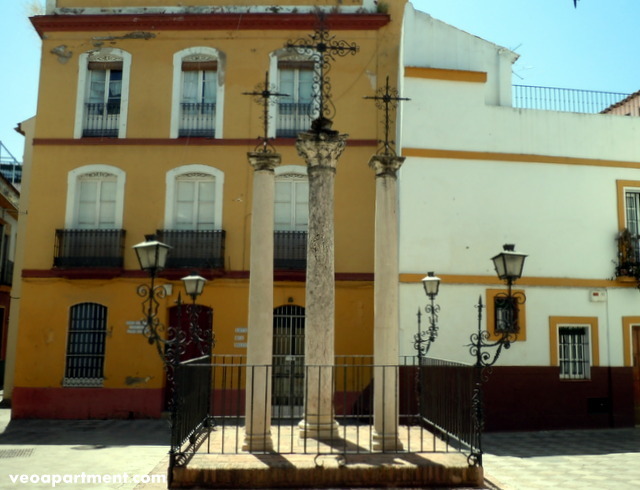 Passing up the street alongside the wall brings you to the Plaza de la Alianza (formerly the Plaza del Pozo Seco or dry well), a charming little square with a simple central fountain, and a couple of bar terraces from which to enjoy it. Follow the wall to reach Plaza Doña Elvira, possibly the most picturesque little square in Seville, and certainly one of the most frequented by tourists. 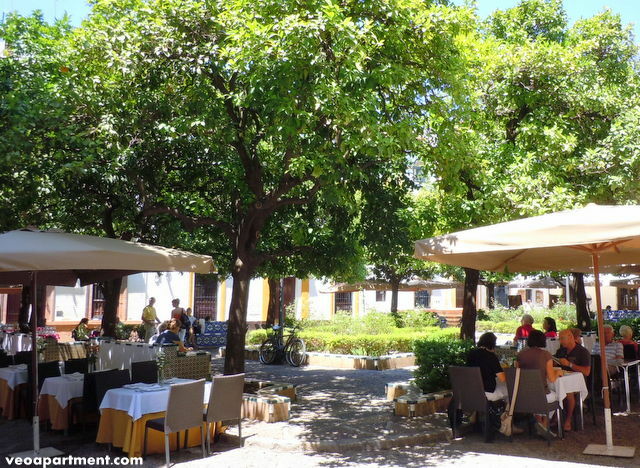 During the day it seems to be almost full of restaurant tables and chairs, but don’t let that put you off enjoying its ceramic benches, fountain and orange trees. 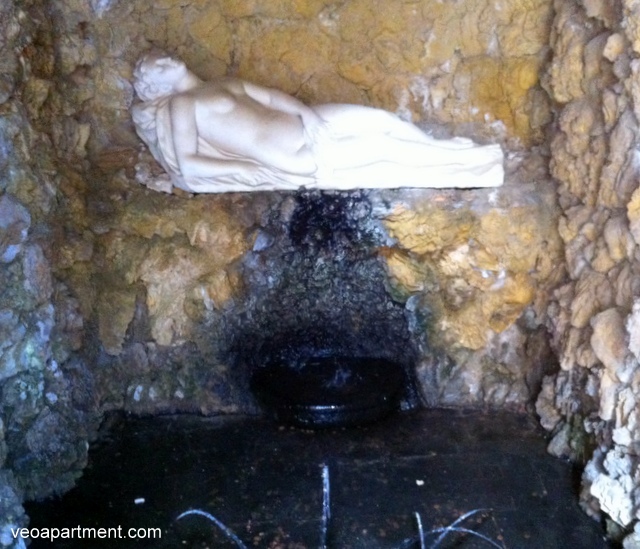 It’s supposedly the birthplace of Doña Elvira, the impossible love of Don Juan. 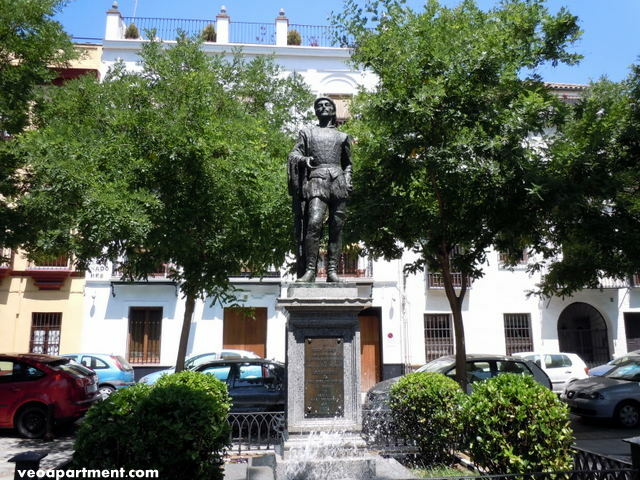 Carry on along the wall through Life Street and Water Street, and past the Washington Irving house, and you’ll come to the Plaza Alfaro, the little square at the entrance to the Murillo Gardens. Look for the Moreton Bay fig trees just inside the gardens, the water pipes in the exposed end of the old wall, and the circular balcony on the corner of the Casa Palacio. Just beyond is the Plaza Santa Cruz, which was once the site of one the Jewish quarter’s three synagogues, destroyed in the pogrom of 1391. It was replaced by the original parish church of Santa Cruz, demolished in turn in 1811 during the Napoleonic era to create the square as it is today. The rather strange metal sculpture in the centre is the Cruz de la Cerrajería with its serpents and four book-reading little figures on the corners, moved here from Calle Sierpes in 1921. Down Calle Mezquita you come to Plaza de los Refinadores (the refiners). I love the circular benches around the palm trees (sadly, two have recently had to be cut down), which make a quiet and shady spot for a few minutes tranquil contemplation. 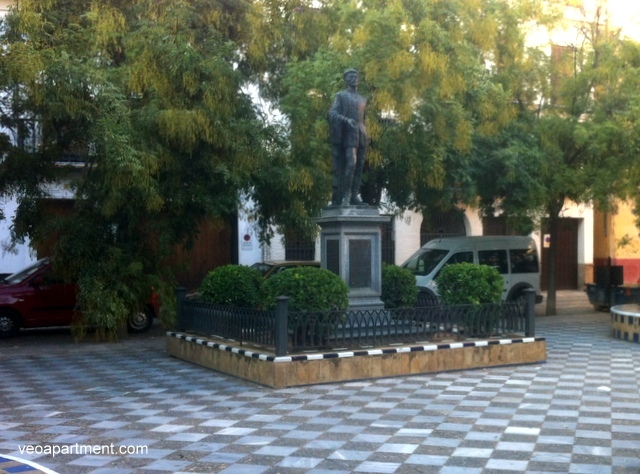 The statue is of Don Juan Tenorio, the legendary womaniser, and was erected in 1975. Also of interest is the house on the corner with the big window balcony, designed for Luis Prieto by Aníbal González, who also designed the Plaza de España. Through tiny Calle Mariscal you come to Plaza de las Cruces, surprisingly not named for the crosses on the columns, which arrived later than the name, but for the wooden crosses at the far end of the street. Turn left there and walk up the hill, and near the top you’ll find a little alley on your right. Through a door at the end is the tiny Plaza de la Escuela de Cristo, one of my favourites for its sheer unexpectedness. For a great base to explore the Santa Cruz, we have a wide range of quality holiday apartments around this enchanting neighbourhood.